For tired, uncomfortable, irritated eyes. Washes, soothes, and cleanses with flexiseal eye bath. Contains natural plant extracts. Specially designed to fit comfortably against the eye to helping prevent leakage.Washes, soothes and cleanses Modern living (such as computer work and air conditioning), dust particles, pollen, grit, and smoke can damage the eyes' surface, leaving eyes feeling tired, uncomfortable and irritated. 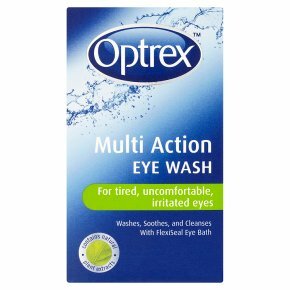 Optrex Multi Action Eye Wash: Washes away particles to cleanse the eye. Is specially designed to soothe tired and irritated eyes. Contains natural plant extracts. Directions for use Adults and children 1. Rinse the eye bath with product before use. 2. Fill with eye wash until a third full 3. Bend head slightly forward, holding eye bath by its base. 4. Place eye bath over your eye. 5. Slowly raise your head, opening your eye so the eye wash flows freely over it. 6. Gently rock your head from side to side for at least 30 seconds. 7. Discard any eye wash left in the eye bath. 8. Repeat steps 1-7 for your other eye. Only for use in the eyes Safe for everyday use. Keep out of reach of children.<br>Do not use after expiry date.<br><br>Important<br>Remove contact lenses before use, allow at least 15 minutes before replacing them after use.<br>If irritation persists seek medical advice. Discard used wash, do not return to the bottle.<br>If the eye bath is likely to be used by more than one person, it is a sensible precaution to sterilise it by boiling it in water for 10 minutes.